This week, Football Book Club will be reading Hyperbole and a Half: Unfortunate Situations, Flawed Coping Mechanisms, Mayhem, and Other Things That Happened by Allie Brosh, chatting about Steven Millhauser’s Edwin Mullhouse, and bemoaning life without the National Football League — as well as the shittiness of our respective teams. 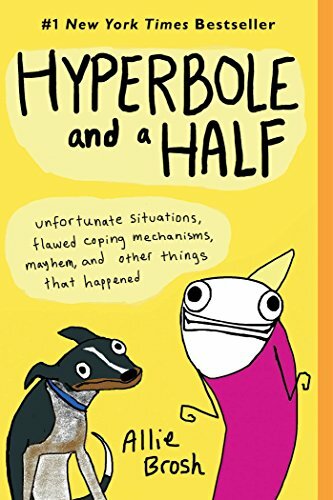 Including excerpts from Brosh’s web comic/blog of the same name and new material, Hyperbole and a Half was a #1 New York Times bestseller, winner of the Goodreads Choice Award for Best Humor Book of the Year, and an NPR Best Book of the Year. I enjoy Brosh’s work and am looking forward to the discussion! Curious: will you be reading old posts of the blog as well? Mainly just the book — but are there any old posts you would recommend in particular? Let us know! !